Over time, the aging process and the effects of the sun, wind and pollutants in the air can wreak havoc on our skin. Unfortunately, our highly competitive society places a premium on a youthful look. A wide variety of medical lasers and light systems are used to rejuvenate the skin. However, every laser is not effective for all skin types. This means patients may have to visit multiple practices to achieve their desired results. Now, our doctor performs advanced FotoFacial RF treatments for patients in our region to effectively remove these unwanted effects and to rejuvenate skin. The FotoFacial RF uses the AURORA/ELOS™ system developed by SYNERON. It combines optical energy with radio frequency (RF) energy to deliver satisfying, lasting results. Now, our patients can enjoy the results they desire regardless of their skin type. How is the FotoFacial RF different from other laser procedures? Unlike other lasers, with a FotoFacial RF, the visible light energy is absorbed by the pigment in the skin's surface, while the RF energy stimulates the production of collagen (which supports the skin) from within. A FotoFacial RF can be used to rejuvenate the skin of the face, neck, chest and arms. What conditions can be treated with a FotoFacial RF? Fine lines, rosacea, flushing, pore size, ruddy complexion, broken capillaries and spider veins, hyperpigmentation, melasma, freckles, age and sun spots, a pregnancy mask, as well as non-pitted acne scars can all be diminished in a softer, more gentle way with a FotoFacial RF. All patients see positive results from a FotoFacial RF without any of the potential side effects seen with other laser systems. What are the benefits of a FotoFacial RF? There is no downtime with a FotoFacial RF. FotoFacial RF is effective on any area of the body where smoother, younger-looking skin is desired. With a FotoFacial RF the results are progressive. 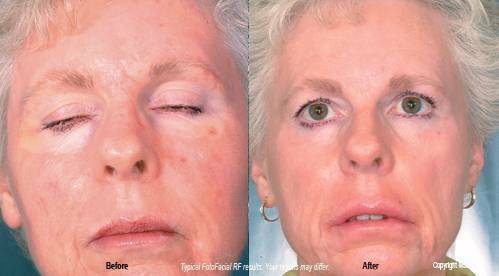 FotoFacial RF provides lasting results. First, we cleanse the area to be treated. Then a thin layer of cooling gel is applied to the treatment area. FotoFacial RF treatments are accomplished through a delicate handpiece attached to the AURORA/ELOS system. When placed against the skin you will feel the cold tip. When the pulse of light and low energy radio frequency is administered there is a momentary sensation that is easily tolerated. Treatments take between twenty minutes to a half hour depending on the size of the area being treated. Usually, 4-5 treatments are sufficient. FotoFacial RF treatments are administered every three to four weeks. The number of skin rejuvenation treatments depends on the area treated, your expectations and your goals. With a FotoFacial RF, the results are progressive. With each treatment you will be more pleased. Your skin will look and feel smoother. Your complexion and skin color will begin to look more even. Fine lines and wrinkles will gradually smooth out. Dark spots and broken blood vessels will begin to fade away. Since the aging process continues after your treatment, maintenance treatments may prevent the return of your symptoms. After Dr. Kinney performs your FotoFacial RF treatment the area is cleansed and you can return to your normal activities. Dark spots and small blood vessels may seem a little more noticeable, but they will begin to fade after several days. Your physician may recommend that you use a specially-formulated skin care product line or prescribe a skin care regime especially formulated for your skin type after your FotoFacial RF treatments. The use of sunscreen is recommended on any treated areas exposed to the sun.